Happy 50th Birthday to Jonathan! 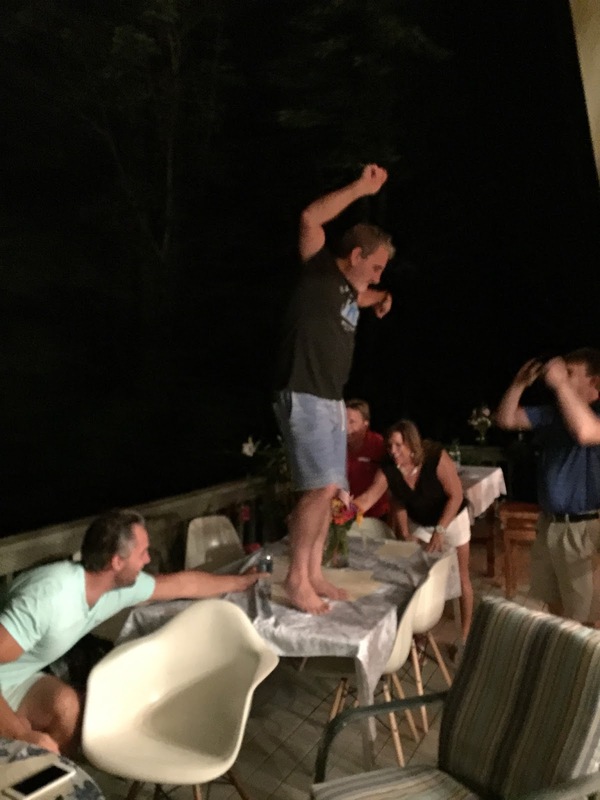 Jonathan celebrated his 50th birthday this summer, what a perfect occasion to pick up our Ten Plates summer tradition. It had been a couple of years since we had hosted our famous Ten Plates dinner party and we were missing this fabulously decadent and major labor of love, summer party occasion. Tash and I devised this feast several years ago to celebrate Jonathan's end of July birthday. He loves to eat, we love to cook. The end result, a culinary gift of love to our sweet guy. 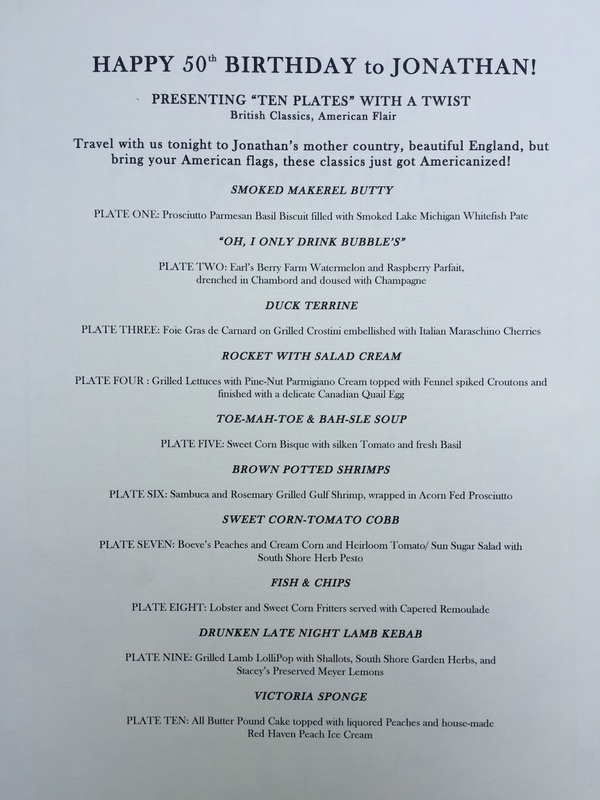 We decided to do a menu based on traditional British dishes, but with an American twist. It's the story of our lives, blending our two cultures together, so much fun, always so interesting, and sometimes a bit controversial! 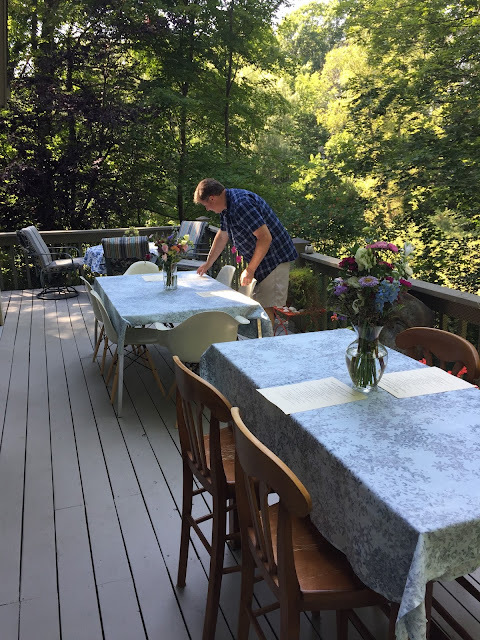 The deck is always on oasis of serene, leafy green and big enough for several tables. Lucky for us, cousins Tasha and Jim came early to help us set up. The party is just starting, and what a party it was! 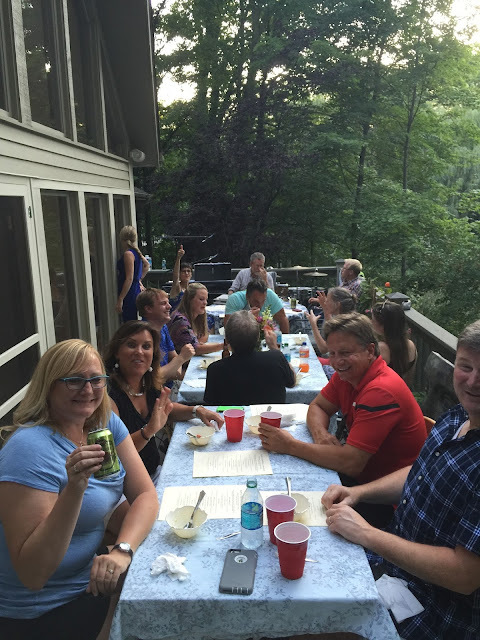 So much fun; wonderful guests, the food turned out great and we even had fabulous music thanks to Will, Beth, Susannah and Chris! Our first course, Smoked Mackerel Butty, was a twist on the famous bacon buttys of England. 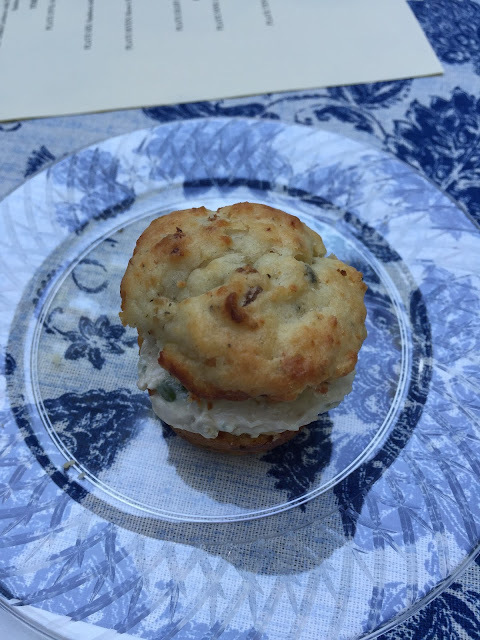 We made our own butty, actually a parmesan basil muffin and instead of the traditional bacon, we sandwiched smoked Michigan whitefish in the middle. It was a stretch, but a tasty one. 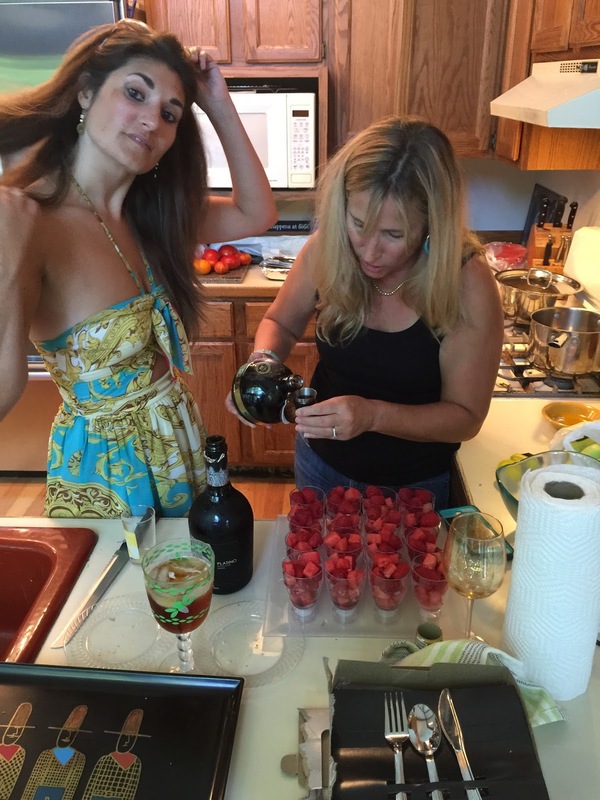 Here, Tash and I are putting together the "Oh, I Only Drink Bubbles," second course, devised to put everyone at very happy ease! Btw, isn't she something? I think so. The third course was one of our very favorites, foie gras. 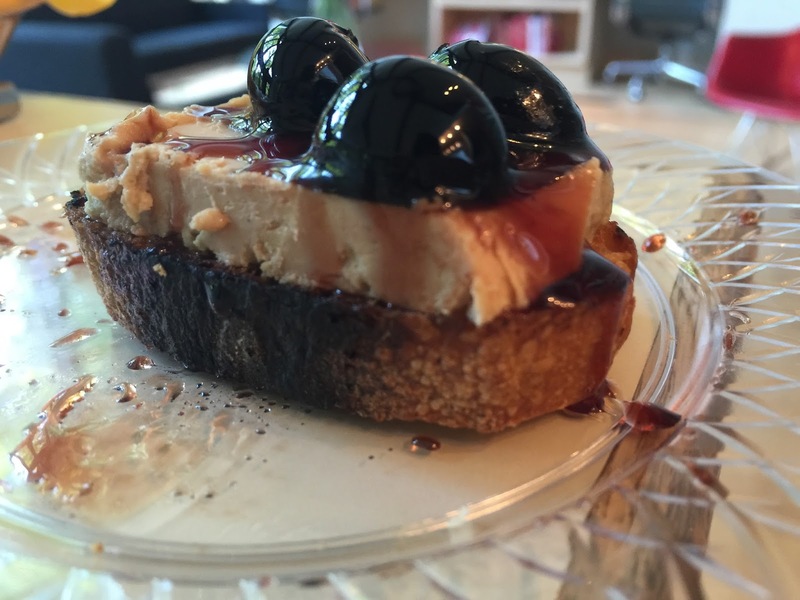 As an added treat, we found Italian maraschino cherries to grace the top. So rich and delicious. 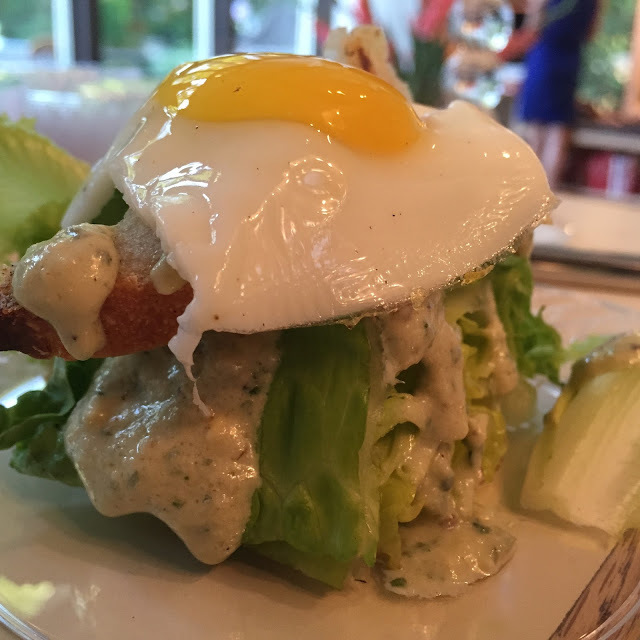 This lettuce dish was a really spectacular fourth course. Finding the quail eggs in West Michigan was a bit of a challenge, but after scouring the Asian stores in Grand Rapids, I finally scored what I needed. 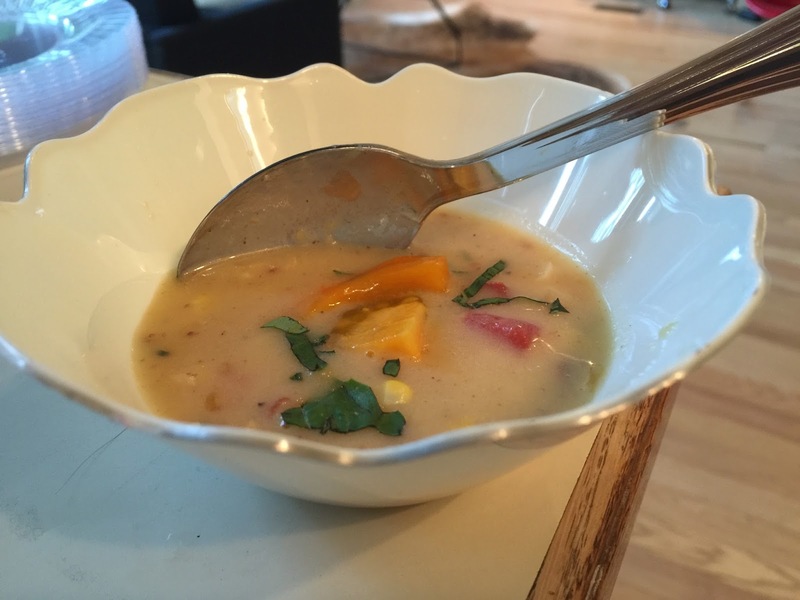 Fifth course, summer soup with fresh Michigan corn, South Shore basil and silken summer tomatoes. These next little guys packed some gustatory punch! Our sixth course is simple to make and full of flavor, yet light and tasty. 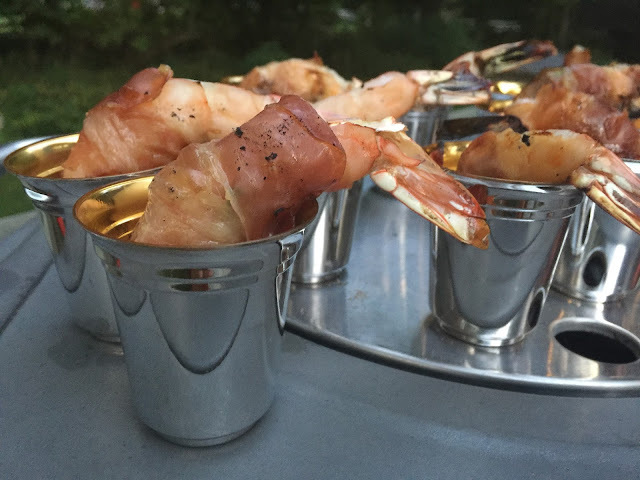 Marinate your shrimp for 10 minutes in Sambuca liqueur (tastes like licorice), wrap in prosciutto and grill for one minute per side. Serve with a bit of sriracha mayo. The result, heaven on earth, but in your mouth! Our seventh course was a spin on all the sweet corn sandwich choices available in your local Marks and Sparks. 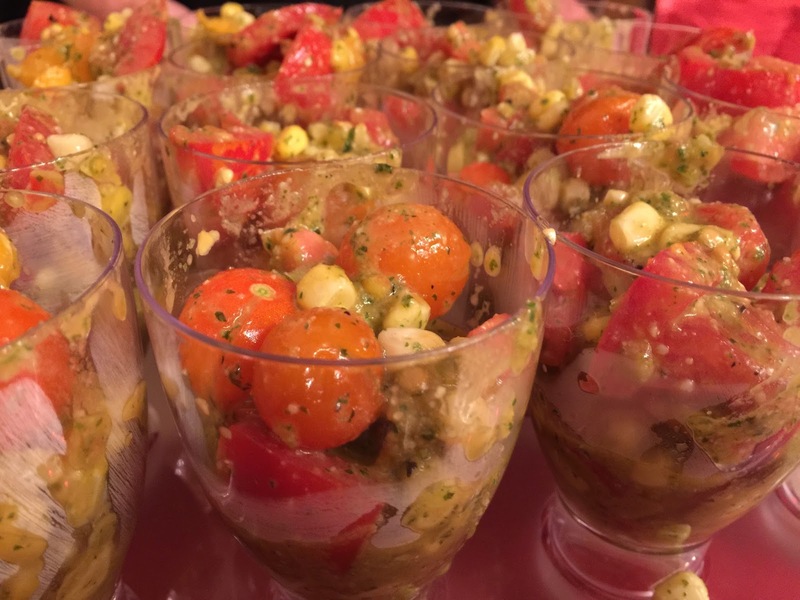 So this is not a sandwich, but it does incorporate sweet summer corn and Michigan summer tomatoes, blended with fresh pesto to make you wish summer would never end. These are as good as they look. 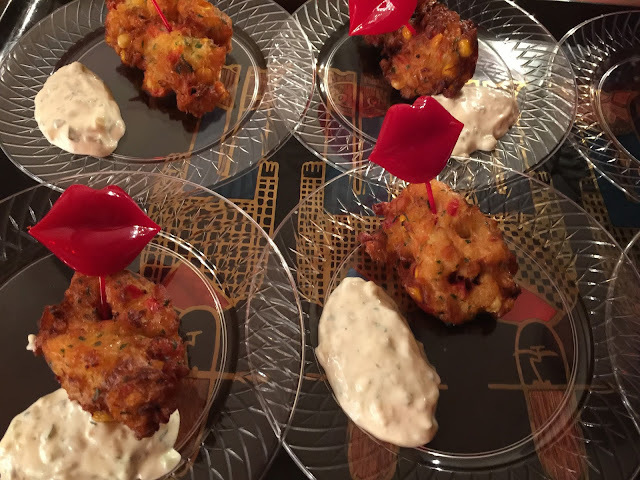 Our eighth course, luscious lobster fritters, with a kiss on top and served with capered remoulade. Kill me now. For our ninth course, we salute Jonathan's drunken late night English vice, lamb kebabs. 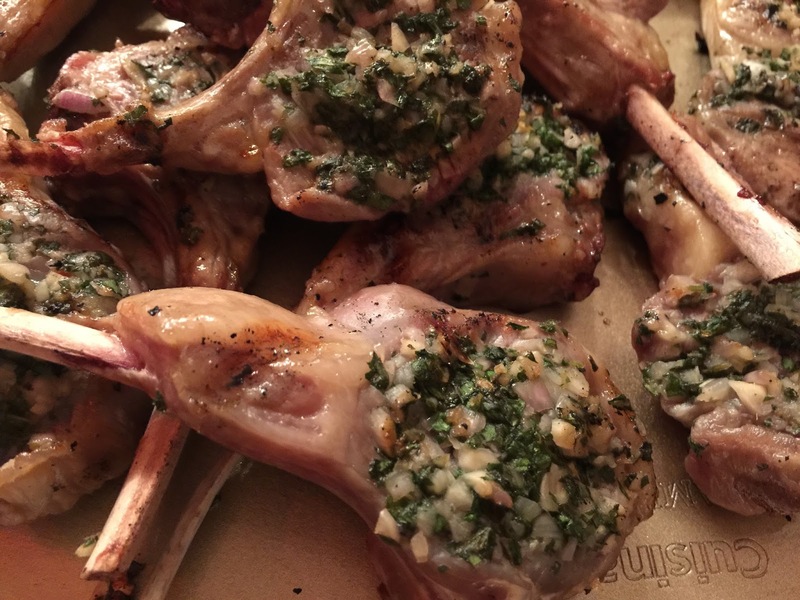 Ours were a bit more refined, baby lamb lollies grilled with herbs and our very own preserved lemons. Jonathan loved them, just saying. 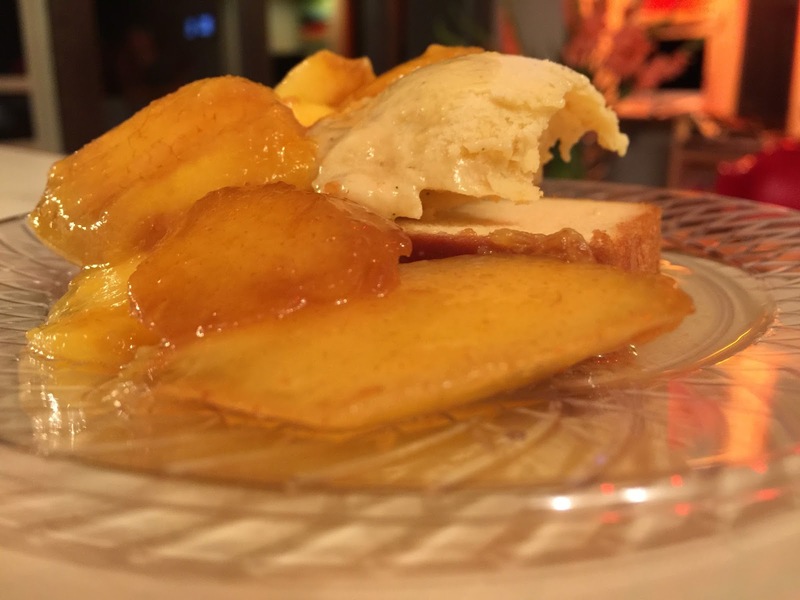 For our final and tenth course, we presented our very own house-made vanilla ice-cream, Michigan peaches and rich pound cake. Suffice to say, all plates were cleared and a very happy night was had by all! Life is best celebrated by enjoying the moment, savoring every memory, and making it all count. Life is fleeting, tender and so very precious. Grab it by the tail! Cheers and best wishes to our dear Jonathan, on his 50th birthday. You are loved. And, as they say, the proof is in the pudding! Here is our birthday boy dancing on the table, cuz all great parties end this way! It was a fun 50th birthday party and super cute too!! I am so pleased that everyone had an awesome time. OMG, that food is tempting. Thanks a ton for the details. Even I am going to host a brilliant bash for my dad’s 50th birthday and have booked the sea side party venues in NYC. Thanks, Mark. I just re-read the menu, and I have even impressed myself! Lol!